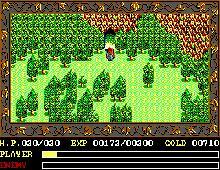 One of the best PC translations of hit console RPGs ever is also one of the first. Ancient Land of Ys is a "light" RPG that features vibrant graphics, a fun story, a plethora of imaginative magical items to find and use, and lots of monsters to kill. The plot is somewhat cliche, but at least it's coherent and well-written: Malificus, the fiendish wizard, has stolen the six Books of Ys and is using them to imprison the people. Your task is to find and collect the six books to restore order to the land. The game is played from an overhead perspective, and fans of console RPGs will be right at home with the graphics style and interface. RPG fans who are only familiar with the likes of SSI's Gold Box games or Wizardry will have to adjust their expectations a bit. In Ys, you only control one character, and the only statistics he has is hit points, which are increased when he accumulates enough experience to gain a level. Your hero bumps into people or monsters to talk to them or fight them, as the case may be. Despite this simplicity, though, charming anime graphics, and a well-written plot make the game very enjoyable. There are some quirks in the game, such as a supposedly "secret" doors that you can go through without wearing the special mask to see it. But such quirks are so few and far between that you will hardly notice them. Overall, Ancient Land of Ys is a charming RPG that nicely introduces console-style RPGs to PC gamers. RPG die-hards may scoff at the game's simplicity, but everyone else will definitely enjoy it. Also, in a pleasant contrast to most games that are translated from Japanese, Ancient Land of Ys is very well-written and even eloquent at times. This game would bode well for Kyodai's subsequent collaboration with Brøderbund that would continue with Psychic War. Two thumbs up!